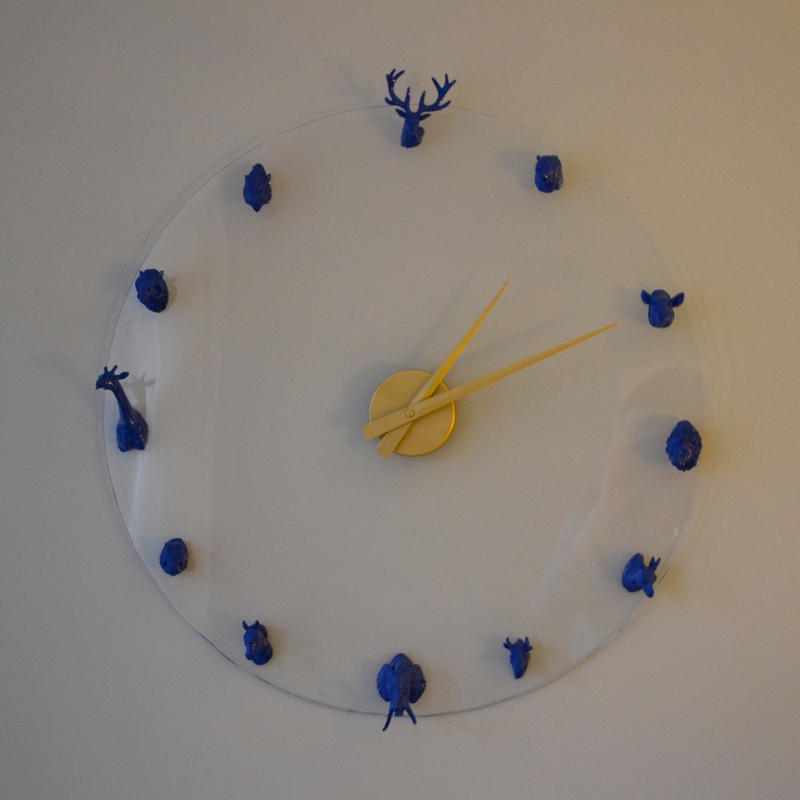 For my next trick, here is the clock I made for my sister Phoebe for Christmas last year. It was inspired by this one from P.S. 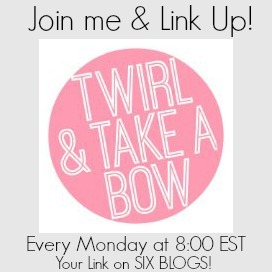 – I Made This… with a few twists. Not the easiest or least expensive project I have done, but the results were pretty awesome, if I do say so myself. Plexiglass circle – our local hardware store cut it for me for around $20. It is not a normal cut so it took a few extra days. 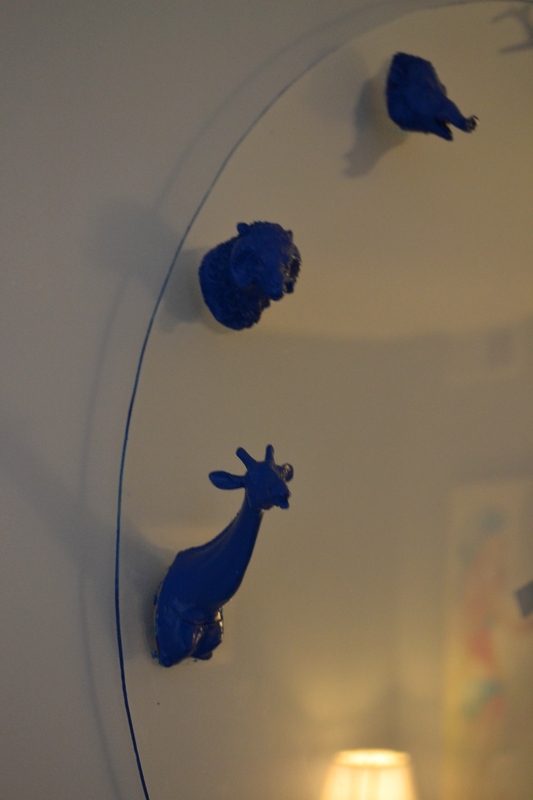 Once I had all of my animal heads, I coated them with three coats of Rust-Oleum Painters Touch Ultra Cover 2X in Gloss Brilliant Blue. It takes some extra time for the spray paint to cure on rubber, so I let them dry for two hours. 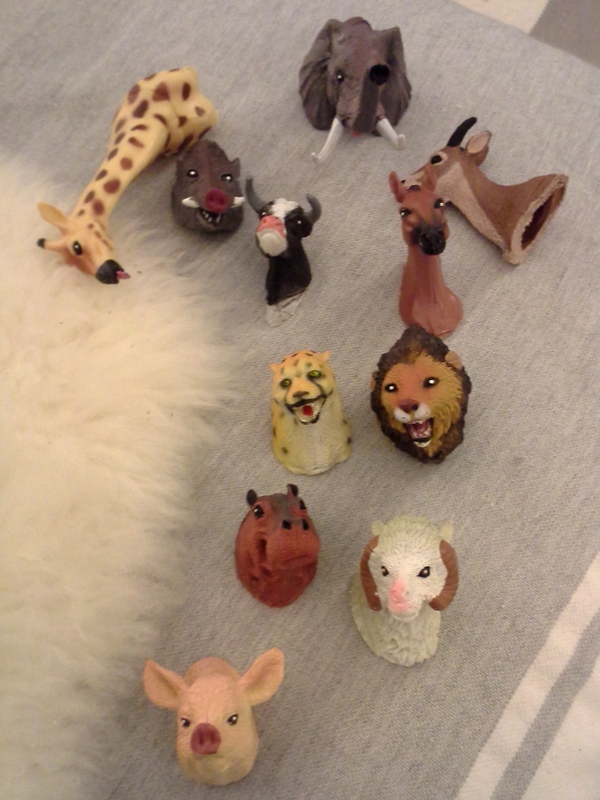 While the animal heads dried, I marked where I was going to glue them. First I marked the middle and then each hour using a print out of a clock and a ruler. I thought I was being precise but I had to make a lot of adjustments after it was all glued down. If I did it again, I would use a compass and a protractor, or at least I would be a lot more careful. Story of my life. 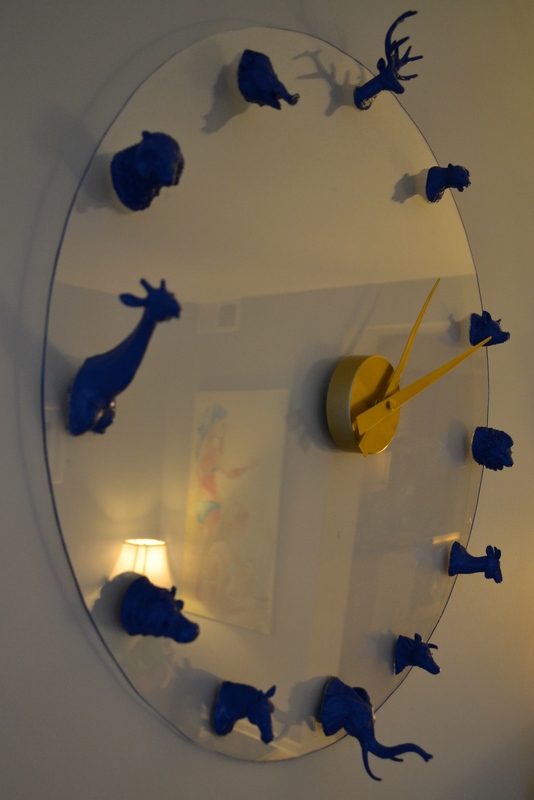 Before gluing the animal heads down, I screwed a triangle picture hanger to the back of the Plexiglass, right behind the clock mechanism. If I do it again, I will put the hanger at 12:00 so that the animal head will cover it. I used a very small drill bit to drill two pilot holes for the screws so that they didn’t crack my precious plastic. 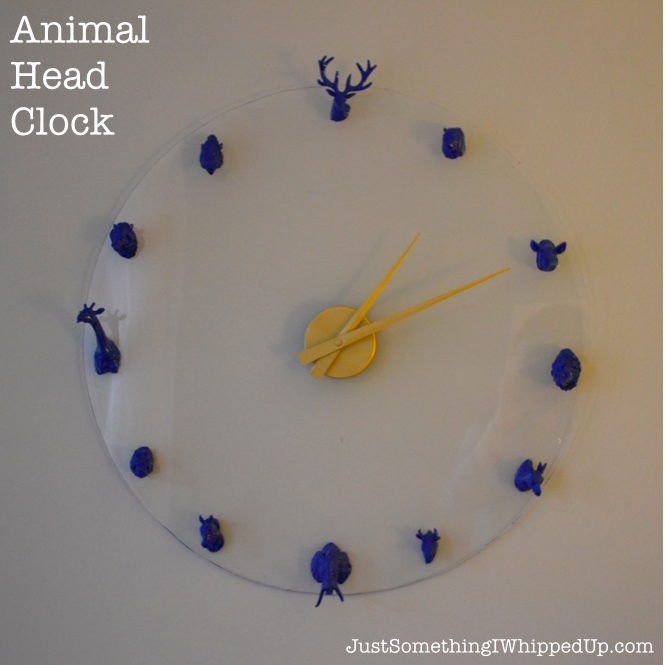 Once I got the hour points right, I glued the animal heads down with a glue gun. Here is a view of the back once it was all put together. You can see the animals at the bottom. The last piece was the actual clock hands. I spray painted it gold, moving the hands between coats so that there wasn’t a bare spot. The battery pack is inset slightly so I built it out with a few layers of poster tape (the foam kind) and then attached a piece of sticky-back velcro. I left the two sides stuck together and then, with the hands together in the 12:00 position, pointing directly to 12, I stuck the clock to the plexiglass. 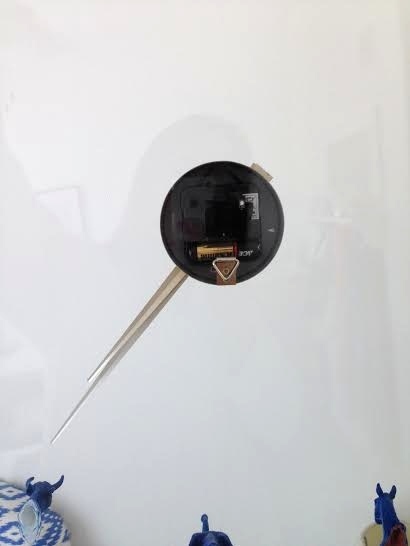 The velcro means she can remove the clock from the plexiglass to adjust the time or change the battery. It was a pretty risky surprise Christmas present, since I had no idea if it would look awesome like it did in my head, or if it would look 100% crazy person. Luckily it was the former, with the added bonus of looking great with the headboard she and my dad made.